Agree with their analysis or not, can we just stop and appreciate this moment, the larger significance of what they’re saying? A female-led, female-produced, and female-targeted movie (Adrift) struggled in its second weekend because there’s already a female-led comedy soaking up business (Book Club, which is nearing $60m domestic after 4 weeks in release, a damn fine haul for any comedy in 2018) as well as a brand new heist flick with an almost entirely female cast (Ocean’s 8, which just posted a stellar debut of $41m for a film rocking a modest $70m budget). Remember when there used to just be, at best, two or three of these female-leaning movies a month? It wasn’t even that long ago. 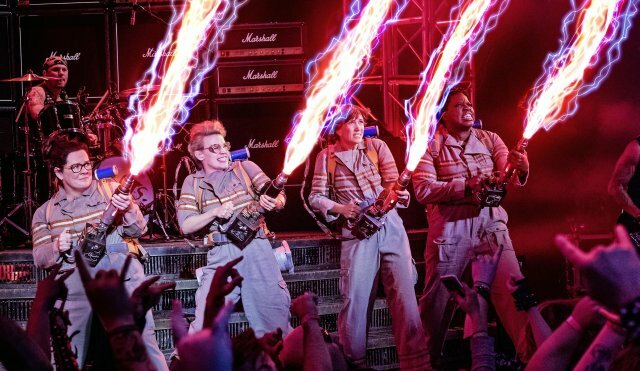 Back in July 2016, the Ghostbusters reboot was the only female-led film the week it came out. By the end of the month, it was joined by just Lights Out (the Teresa Palmer-led micro-budget horror movie) and Bad Moms (Mila Kunis, Kristen Bell, and Kathryn Hahn’s insta-franchise). Nearly two years later, we have so many they are starting to hurt each other at the box office. Well, not so much for Adrift, a gut-wrenching film more people should see despite that regrettable third act twist, but it’s great for us as consumers. In fact, as of right now 9 of the top 13 films at the domestic box office are either female-led (Ocean’s 8, Hereditary, Adrift, Book Club, Hotel Artemis, Life of the Party, Breaking In) or co-led (Overboard, A Quiet Place). Some of those films are doing better than others, like poor Hotel Artemis, which just bombed, or Life of the Party, Melissa McCarthy’s lowest-grossing movie to date. Still, this particular moments feels like the end result of years upon years of consistent lobbying. 2013 – The Hunger Games: Catching Fire outgrossed Iron Man 3 to win the title of “highest-grossing movie of the year,” the first female-led title to do so in as long as anyone could remember. Behind Iron Man 3 on that list? Frozen. Not too far behind that? Sandra Bullock’s Gravity. 2014 – Gone Girl delivered Gillian Flynn’s best-selling novel back to a majority-female audience (60% on opening weekend) on the way to becoming one of the most profitable movies of the year. 2015 – For better or worse, Fifty Shades of Grey shattered one box office record after another, the Elizabeth Banks-directed, Kay Cannon-written Pitch Perfect 2 improbably crushed the competition at the summer box office, Mad Max: Fury Road put a feminist spin on an old testosterone-driven franchise and rocked all the way to Oscar night, and Star Wars: The Force Awakens gave us (please forgive the following pun) a new Rey of hope. 2016 – Hidden Figures and its $200m+ worldwide gross started chipping away at the old “colored films don’t travel” belief. 2017 – Star Wars: The Last Jedi, Beauty and the Beast, and Wonder Woman, all female-led blockbusters, ended as the first, second, and third highest-grossing films of the year. The last time female-led films made up the trifecta like that was all the way back in 1958. Now, in 2018 we’ve had so many female-led box office hits (Quiet Place, Insidious: The Last Key, Blockers, Book Club, Hereditary, Oceans 8), misses (Wrinkle In Time, I Feel Pretty, Red Sparrow, Annihilation, Proud Mary), and in-betweens (Tomb Raider, Winchester) it’s starting to feel like we should stop calling them “female-led” and simply think of them as normal movies, with any gendered description being obsolete at this point. The rest of the year promises co-headlining roles for female superheros (Incredibles 2, Ant-Man and the Wasp), a long overdue Mamma Mia sequel, a Mila Kunis/Kate McKinnon action-comedy (The Spy Who Dumped Me), a Constance Wu rom-com (Crazy Rich Asians), and that’s only looking as far ahead as August. It’s a huge shift from when Ghostbusters came out and was burdened with having to carry the entirety of female representation on its shoulders. There was such a fear that if the film failed financially that would be it. Hollywood’s female initiatives would close up shop and business would go back to normal, much like in the post-Supergirl, Tank Girl, Aeon Flux, or Elektra years when one female-led failure led to decades in the desert for any similar projects. However, Ghostbusters was allowed to fail, and the same exact financier, Village Roadshow, moved on to making Ocean’s 8. 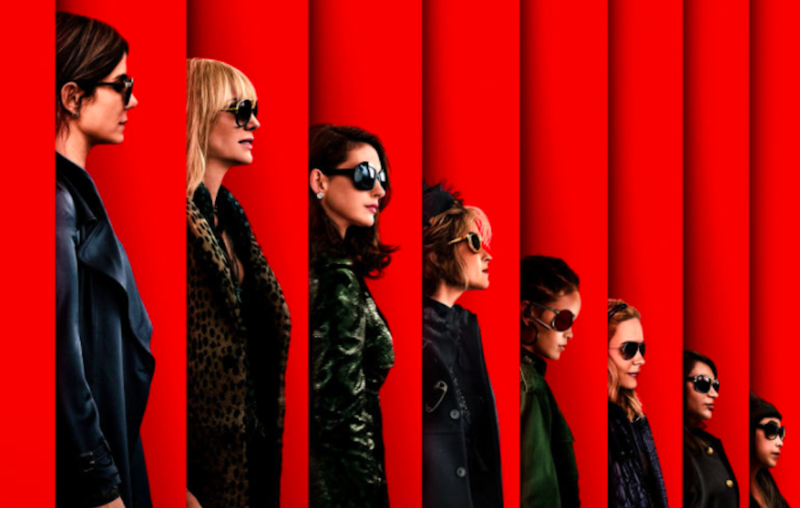 Lessons learned: Don’t overspend (thus Ocean’s 8 having a budget half the size of Ghostbusters). Attract a more international cast (Rihanna’s international appeal is certainly superior to any of the girls in Ghostbusters). Stop with the wishy-washy feet-dragging over whether you are a remake/reboot/sequel (as was Ghostbusters’ problem) and make a damn decision which you can easily communicate to fans (thus Ocean’s 8 being quite clearly a spin-off about Danny Ocean’s sister). Ultimately, make a better movie. That’s what’s ahead. In the here and now, the dude superheroes and male blockbusters stars who normally top the box office charts are suddenly surrounded by Sandra Bullock, Cate Blanchett, Rihanna, Mindy Kaling, Toni Collette, Shailene Woodley, Diane Keaton, Jane Fonda, Candice Bergen, Mary Steenburgen, Jodie Foster, Melissa McCarthy, Gabrielle Union, Anna Faris, and Emily Blunt. Say what you want about the merits of their individual films. Slice their box offigure figures however you see fit. Argue oversaturation if you must. But, dammit, this moment has been a long time coming. Well, I am happy about the trend…not that I intend to watch Oceans whatever, but then, I never really got into that franchise despite usually being a sucker for heist movies. The good thing, then, is you have the option to skip it and not feel guilty about it, not feel as if you have to support the film in the name of female representation. The majority of films in theaters right now are already advancing that cause. Yeah, I think Hollywood is just taking the next couple of weeks off overseas, too scared to compete with World Cup. That’s why Jurassic World is out over there right now 2 weeks before U.S.
And why Ant-man and the Wasp will start with a delay this time around. We also won’t get The Incredibles before November. Infinity War should hurry up to reach that two billion mark….